While Dowth has never been scientifically investigated an 'excavation' by dynamite in 1849 left the mound considerably disfigured with a massive crater in the top. About half of the cairn material had been removed prior to this for road building in the early 1800's. 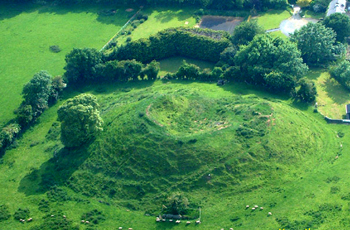 There are two passages on the western site of the mound, referred to as Dowth North and Dowth South. Dowth North is 14 metres long. Dowth South is 3.5 metres long and is aligned to the setting sun at the winter solstice. There is no public access to the chambers at Dowth, but on the evening of the winter solstice the Office of Public Works allow a small supervised group to enter the Dowth South passage to see and photograph the carvings. 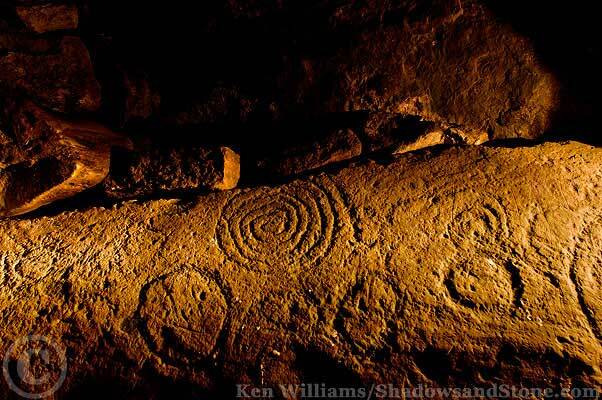 This image is of the stone in the small side chamber illuminated by the light reflected off the back wall of the main	chamber. 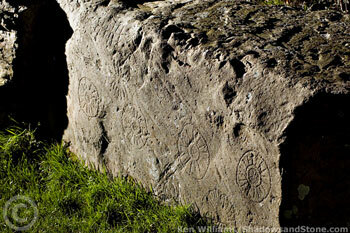 On the east side of the mound one of the exposed kerbstones has been aptly named as the 'Stone of the Seven Suns'.